CBP- FROM $199 Stylishly Updated!, Huge Deck! 4 BR & 3 FULL Baths! Relax, Get Away, Be Romantic, Family Fun: While there are 100's of activities close by for all members of the family. You may want to choose a nice quiet get away from your everyday busy lives. This property is located on a nearly 100 acre lake with canals for canoeing, kayaking, pontoon boating, water skiing, tubing, wake boarding, parasailing, fishing, diving... any water activity that you can think of on an All-Sports Lake. 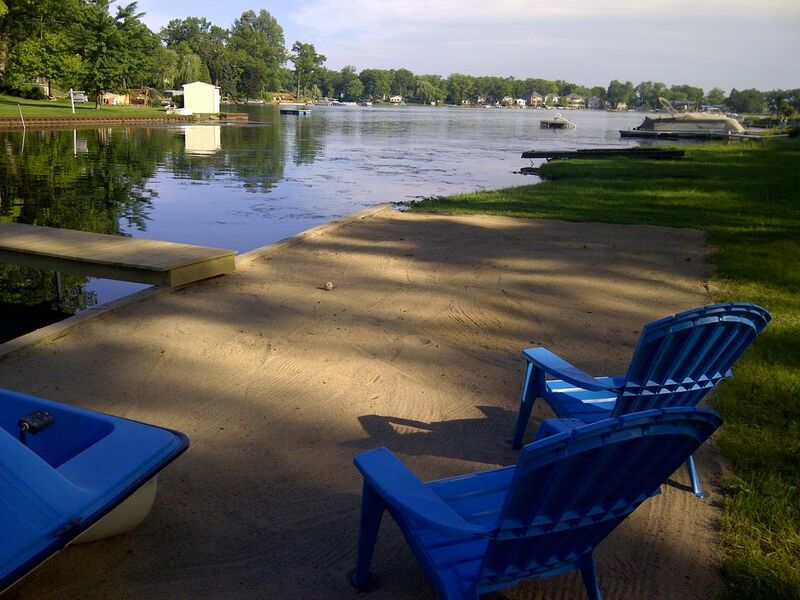 The lake also features a very large sand bar for spending entire days of leisure and/or fun. The sand bar offers all sorts of activities, including water volleyball, if you wish. The lake is Private, so you may even have it all to yourself on some days. Or you can choose to stay on your own private beach and have sunset drinks by you own bonfire. Perfect for relaxation, romantic get away, or family fun. Location, Location, Location!!! : Whether you are visiting for a family reunion, attending the concert of the year at DTE, or just want to get away for a few nights of gambling at one of many nearby casinos, this property is conveniently located from anything. Situated 30 miles from downtown Detroit. Which offers casinos, Comerica Park, Fox theater, Ford Field, Joe Louis Arena, Cobo Hall, The Detroit Opera House, the Auto Show... to name a few. The property is also only 30 minutes from Ann Arbor and University of Michigan. Michigan State University is only 50 miles to the East. DTE Energy Music Theater (Pine Knob) & The Palace of Auburn Hills are only 10-15 miles away. Golf dozens of beautiful courses- just minutes away. Golf Packages available. Ski Alpine Valley ski Resort, just 5 miles up the road. Shop and Dine at World Class malls and Restaurants. This property offers almost anything that you are looking for, just minutes away. SANDBAR! : Swim, Boat, Float, Snorkel, etc to a huge SANDBAR for all day fun!!! The upper deck overlooking the lake has chairs, table, umbrella, benches, and a grill. The lower deck has lounges, chairs and tables overlooking the beach and lake as well! Fire pit near the beach and chairs by the lake. Special discounts for all area lift tickets at Alpine Valley Ski Resort, as well as ski and snowboard rentals. Special discounts for golfers at many area courses. Inquire when booking for specifics. This is a great place for a ladies week or weekend away. It is also a wonderful place to stay when visiting friends or family. Close drive to both U-M, OCC, and MSU. Stay here and attend the home football games. A great place to stay and attend all major college, and professional sports events. There are many festivals in the area, as well as music concerts. It is a close drive to all of these events. There are lots of things to do close by, but the home is located in a very private setting. Large table with seating for 10-12 people, and a 6 stool cabinet height bar top. While there typically is firewood and propane gas left on the property, and renters are welcome to use what is there, but asked to replace what they use. Propane gas for the grill and firewood is the responsibility of the guests. The home comes supplied with durable goods: silverware, plates, glasses, cloth towels, linens, washcloths, etc. Disposable goods (while sometimes left by previous guests) as in: laundry soap, paper products (plates, napkins, towels, additional toilet tissue, etc), fabric softener, dishwasher detergent, shampoo, plastic cups, firewood, propane gas, etc… are the responsibility of the guests. Enjoyed our stay at the house. Initially we could see that it was not used for a few months over the winter. But the renter Tia stepped up and made sure everything was cleaned. Would consider staying there again!! We had a wonderful time. The kids loved the beach and the adults enjoyed all three of the decks. Ample towels and great variety of toys and life jackets for all. Everything worked and the grill handled two pork butts and a brisket on Father’s Day. Sand bar in the lake was amazing and the neighborhood (aside from one of the immediate neighbors) was welcoming. Highly recommend this location-just be aware that the well pump has limited capacity. Just can’t take multiple showers at the same time. Thank you for a great experience! It was perfect...but not too perfect!! The day we arrived, we were super stressed because our daughter was getting married in two days and we had been running around like chickens with their heads cut off! When we got there, we took a moment and sat on the deck with the beautiful view and just breathed a sigh of peacefulness. It was just what the doctor ordered! During our stay, we had family coming and going with many trips to the airport and back and to the wedding venue with the rehearsal and rehearsal dinner and set up and tear down and at the end of every day we were able to come back to that peaceful view. It was so much better than going to a cold hotel room. We had several children staying with us and it was so nice that the place was comfortable but not pretentious. The house had just the right amount of wear and tear... The kids were able to just be kids and have fun! It was a great place to gather and we made many great memories there. Everyone loved this house. Owner is amazing. so hospitable. Everyone would love to come back next year. We reserved this home, last minute, because we are a large family that was coming in from out of town for a memorial service. We didn't have many options so we settled on this property. We were so pleasantly surprised with the home - the pictures don't do it justice. There were 13 of us and there was still room for more people if we needed it. The owners left us sweet notes for our arrival and were very flexible with us. They even left us a yummy bottle of wine. The beds upstairs were super comfy - something that's hard to find w/rentals. The property was beautiful. The only downfalls were some of the amenities didn't work well. The vacuum was an electrical hazard, the dryer took forever and made weird noises and most of the remotes didn't work for the televisions, etc. (and the TV's only had a few basic channels). Also, the couches weren't very clean and could maybe use some slipcovers. However, I'm very picky and still thoroughly enjoyed our stay here. I would love to bring the family together again, for a better occasion, and all stay here during the summer. Thank you so much for your review! We are glad your overall stay was comfortable. We are so pleased when we get feedback from guests with issues that we wouldn't otherwise find so easily. Since your stay, we have replaced batteries and ensured that the remotes worked. We rented a fabric cleaner machine to handle the tough cleaning of our couches. The vacuum cleaner is an old one, it will be replaced! The cable during this season is pretty basic and the nightly rate reflects that, however during our summer months, the programs get upgraded. Thanks again! We enjoyed our stay here with a party of 9. Plenty of room for everyone. HUGE SAND BAR FOR ALL DAY FUN! Security Deposit or Protection Plan required for ALL STAYS $300-$500 MINIMUM FULLY REUNDABLE SECURITY DEPOSIT for ALL STAYS. PONTOON BOAT AVAILABLE FOR RENT (ADDITONAL SEC DEP FOR PONTOON BOAT) Holiday nights and the night before AND after that Holiday are charged as weekend nights One month is equal to 4 weeks, or 28 days.